Ahhh, pre-season. I've had 15 years of them and they don't get any easier! They have certainly changed though. Mainly through the advances in sports science but also the player adaptation that has been required due to the changes in the game. No longer can a quick player be just quick - he must be powerful too. A strong player can't just be strong - he must have the endurance to play, and contribute, for 80 minutes. There have been fads that have come and gone; 3km time trials, bleep tests, two-minute runs - all the rage at the time - have fallen by the wayside in favour of yo-yo tests, phosphate decrement runs and conditioning games. And there's no hiding place. GPS tracking systems are worn by the players during fitness sessions measuring distance covered, speed and amount of maximal efforts; heart-rate monitors are strapped around your chest to ensure that you are as close to dying as possible without actually imploding; lactate tests are performed to see how quickly the lactate builds up and how quickly it dissipates post maximal efforts. Finally, there's the 'bod-pod', a chamber designed to measure your body's fat content in one fell swoop - a prop's nightmare (and some scrum-halves). These measures aren't unique to any one team, though, as this is the norm, certainly amongst the Premiership, Pro12 and many national sides. The game is professional and everyone is looking for that little bit extra. It's not just club teams hitting pre-season at the moment of course. The World Cup starts in September and with that brings a fantastic opportunity for coaches and management to get hold of their players for a continuous, minimum two-month period. All countries will benefit from this, but you would think that the Pacific Island teams of Samoa, Fiji and Tonga have the most to gain. They have natural talent in abundance, players strewn over the Premiership, Top 14 and Pro12 but lack preparation time together. During an international Test window, they would meet the week of their game, try to cobble together a game plan, maybe get to know each other's names and then hope for the best. This summer, they have the opportunity to bond, learn and improve together and this is dangerous for the opposition they come up against. 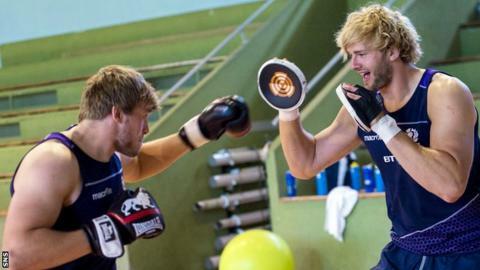 Scotland have an exciting pre-season programme. Four games leading into their World Cup opener against Japan should have them battle hardened and comfortable with their game plan, but it's during training time and in camp where I think the most important shift will be made. Glasgow Warriors won the Pro12 title this year, thumped Bath at home, beat Montpellier away, while Edinburgh got to the final of the European Challenge Cup. These players will make up the majority of the 23-man match-day squads and the belief that all those players must have now needs to translate into test matches. Playing with confidence and skill in pressured environments is what the World Cup is about and, due to this season's club successes, I think it will push the players on, aspire them to aim high, set high standards in training and translate into their performances. Plenty will be done in the gym too and the GPS vests certainly won't be gathering dust. Players have been separated into 'fitter, stronger, faster' categories depending on their primary needs and individually tailored to suit the way Vern Cotter wants Scotland to play. Cotter has a significant amount of time this summer to mould his team and emphasise improvement in certain areas and rugby development seems to have been at the forefront of the plans. Of course it should, you say, but I've been involved in many a pre-season when a ball isn't introduced until the second month and instead focused on gym work. A welcome change in philosophy in my opinion. Now, if someone could just vandalise that 'bod-pod', I can get on with enjoying my holiday.